...... Anyone who can answer a question in your organization can become a documentation expert. Built-in annotation and text editing tools give you everything you need to create a complete how-to document. 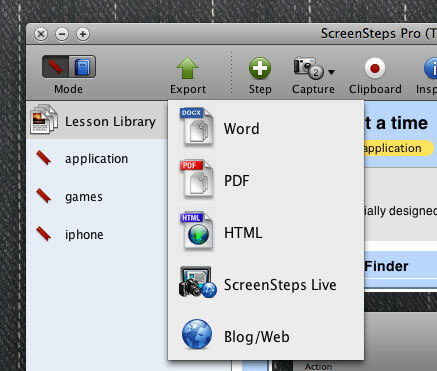 ScreenSteps allows you to assemble these documents into manuals complete with a table of contents. There are many screen capture applications available. But ScreenSteps does something different. Instead of just capturing images, ScreenSteps automatically creates image-based documents as you capture your images. Qweas is providing links to ScreenSteps 2.9.1 as a courtesy, and makes no representations regarding ScreenSteps or any other applications or any information related thereto. Any questions, complaints or claims regarding this application ScreenSteps 2.9.1 must be directed to the appropriate software vendor. You may click the publisher link of ScreenSteps on the top of this page to get more details about the vendor.